This is the continuation of “The Encounter I” as Dan begins writing his children’s book for Adults. Paul said he could not speak to them as adults but still had to speak as unto children. I think we can all still enjoy a good children’s story in our old age, and “The Little Bird that Couldn’t” packs a strong message. He couldn’t remember why or how. All he knew was that he couldn’t… he could not flap his wings. Yes, he had wings, but they would not flap! Yes, he could stretch them out, but they would not flap. This is the story of the little bird that couldn’t. Such a sad story in the beginning, but what a happy ending! “What good are wings that will not flap?” asked the wise old owl who sought to help him. “Hmmm,” the owl considered, as he tried to find an answer full of wisdom, because that was the job of owls in the bird kingdom, to have wise answers. But alas, he could think of nothing. So the little bird continued on, walking wherever he went. It was not the way of birds to walk, but it had been his way for as long as he could remember, and not even the wise owl could give him any hope, as he continued walking. He did not know this land he was in, for he had walked many weeks now. He missed home even though it had been a cruel place where the other birds laughed at him. But he just wanted to fit in, have friends, and a place to belong. They called him, Flapless. “Here comes ‘Flapless’!” they would yell. “Hey Flapless! We’ve decided to hunt for worms in the far meadow over there! See ya when you get there, if we’re not too old! Ha, ha, ha, ha, ha!” they would laugh as they flew away. Finally, he just kept on walking one day, and thus his quest began. Surely someone could help him find an answer, or at least a place he would be accepted and make it his home, but for weeks now it had been one dreary mile after another, and nothing but disappointments, like the not-so-wise old owl. As darkness settled in for another night, he found a spot at the base of a large tree to snuggle into and take his rest. Sometimes, as he slept, he actually dreamed about flying! It was a wondrous thing! Every night as he closed his eyes he said a little prayer that he might fly. But it was only a dream; and even those were far and few between. He was a sad little bird. His heart broke more every day as he longed for something that should rightly be his, but for some unknown reason, was not. When morning came he ruffled his feathers, shook himself, and came out. Then he stretched his wings a far as he could and tried to flap! Still nothing. “Oh well, at least my legs still work, I guess.” Then he pecked the ground and swallowed a large worm before pressing on with the quest. It had been three days since his encounter with the owl, three long and silent days. He was tired of only hearing his own voice, and thinking his own thoughts. “I wish I had someone traveling with me,” he said out loud, but again, no one was there to answer back. Now the land before him was changing and he had a choice to make. Ahead was a fork in the road with a big tree standing tall. He stopped at the tree and looked to his right. To the right he saw nothing but very tall mountains, and who knew what dangers might lurk there, because he had never been in mountains before, and so they were strange to him. Now to the left the road continued with lovely rolling hills, green grass, butterflies, and pleasant travel, but to the right it looked rocky, dangerous, lonely, and perhaps even cold. The answer seemed obvious as he started veering down the left path. “Are you sure you want to go that way?” a voice asked. “What? Who said that?” the little bird asked while looking every way about, but seeing no one! “I did,” the voice came again, and it seemed to come from the tree! Now the little bird was very confused and startled! For obviously the tree had spoke to him but said, No! So if the tree did not speak to him then he was not going crazy because trees do not speak and “no” was the right answer, but how could the tree not be speaking if he heard it say, No? So he was crazy either way! “What am I going to do, what am I going to do?” the little bird fretted. “My journey has driven me crazy!” Then he hyperventilated and passed out. Oh, you do not want the story to end here? Do you know how much work it is to keep on writing? To keep on creating? To keep on giving this bird life? To give it a story to tell? And how about all the work it is for you to read these words? The more words I write the more work it is for you to read? Right? Okay, if you insist. But just for you. The next morning, as the little bird began to regain his senses, he was surprised to find he had lay there all night! And now the sun was rising and it was the next day! Was he still hearing voices? If he spoke to the tree would it answer him again? Was he still crazy? “So you are, my fine feathered friend,” the voice came again. Immediately, the little bird’s heart started racing again, and his feet wanted to run away! But he did not look up into the big tree yet, as he focused on calming his heart, for there must be a great mystery here, and the answer he wanted to know. The little bird took a big swallow as he gulped and said, “Ha! Yes! Of course! How silly that would be! Everyone knows that trees do not talk! But the wind does?” came his nervous half frightened question. The little bird hesitated. Whatever his real name had been, it had gotten lost in all the name-calling. Even his own brothers and sisters had called him various names once it was discovered he could not flap, but eventually one name seemed to stick, and everyone began to say it, “My name is, Flapless,” he said, with his head turned down. “Wow,” Flapless thought, “a great gift. But what does it mean? What can I do with this gift? I still wish I could fly. But he was afraid to speak any of these thoughts out loud. “So, do you trust me, Flapless?” the Wind asked. “Trust you? I hardly know you,” he answered. “Why do I need to?” Flapless asked. “Because I am ‘All-Knowing’,” the Wind answered. Only silence followed the Wind’s final statement, for everything it had asked, it asked for the benefit of the bird, for it knew all things, and had no need to hear the answers, only Flapless did. The next day a box turtle was passing the tall tree just as Flapless was waking from his sleep. He had hardly slept all night thinking about the last thing the voice, the wind, had said. He did not want to leave this place until he heard more, but what did this great mystery mean? The wind is All-Knowing? What if the wind were All-Knowing? What would that mean? So as Mr. Turtle was slowly making his way past the tree, Flapless could not help but want to talk to someone. An hour had slowly passed and the turtle was still close by, as turtles move very slow, and this one was old and very very slow. As a matter of fact, he was very very very very slow, because not only was he old, he only had three legs! He felt sorry for the turtle, but decided not to mention the missing leg. Some tragic thing had happened, but Mr. Turtle had survived and was living his life, just like he had been forced to live with wings that did not flap. “I’ve heard that before,” Flapless thought. “So long, young fellow, and good luck!” the turtle answered as he began to move again. “No, I don’t believe I did. What did you hear?” the turtle asked, for he was still close by and wanted to know. Mr. Turtle could only hear one side of the conversation, but he had paused again so he would not miss a thing. He was afraid he would get too far away and not be able to hear, especially if the conversation went on for a day or two. “I know I can help you,” the Wind answered. “Hey Mr. Turtle! Did you hear that?” Flapless shouted. “Hmmm,” came the thoughtful answer again, as Flapless continued waiting. So Flapless took a few steps passing the turtle on his way. He did say bye, and thanked him for his advice. Mr. Turtle sighed as he watched the little bird disappearing down the road, and said, “Boy, he is really flying! He’ll be there in less than a week at that pace!” And then he turned left to continue on his way. There were only several hours of daylight left, so he planned on camping for the night at a rock he could see just up ahead. That night Flapless snuggled up in a pile of leaves that were trapped against a fallen tree. As he stared up into the starry sky he began to question the events of his day. “Did I really hear the wind talking to me? I passed several trees today and never heard the voice even once, not even a peep! What if I’m wrong? Will I find food up in the mountains? Do worms live there? Is the ground too hard and cold?” his thoughts continued in endless chaotic circles of fear and doubt. “What is a Prophet, anyway?” he considered. “The Book of the Ancient Ways says they are a person who hears the voice of God, and speaks of invisible things of another kingdom. Sometimes they even tell us the future! Wait a minute, if I’m hearing such a voice, does that make me a Prophet? Or possibly a Prophet in training? Could the mountain be my great test?” Flapless was very lost in his thoughts when a voice from above suddenly interrupted! “A voice!” Flapless shouted to himself, but then he thought, “Hey, bro? What kind of voice is that?” So as he looked in the direction of the voice, he spotted a small bird, a very small bird, much smaller than he, for it was a wren, and the little bird was perched on a limb above him. “Yeah, I get missed a lot, but are you planning on sleeping down there?” the little wren asked. “Yes, the same book,” the wren agreed. “I’m a raven,” he answered. “Hmmm,” the little wren sounded. “What do you mean?” Flapless asked. “Well, starting from the beginning, I left home because I did not fit in, and I decided to go on a great quest in search of answers.” And so Flapless began to share every detail of his story with his new friend, Goliath. The crickets chirped in the background as he described his great torment of having wings that do not work, and all his fellow birds who had hurt him with insulting names. He told of the owl who who who could not help him, and his many weeks of walking, walking, and walking. Until he finally had his encounter with “the Voice”, which he thought was the tree talking and he had gone crazy. But thank goodness it had turned out to be the wind speaking to him as it blew through the leaves of the tree. Then there was the turtle and his advice to listen to the wind and take the road to the mountains. Now here he was. “Well, it was a few feet away,” Goliath confirmed. Goliath’s last statement was followed by a few minutes of silence, as both were lost in their own thoughts. The crickets never stopped chirping, and the stars never stopped shining as the two kept each other company. But finally, Goliath began to talk again. “He said he was All-Knowing,” Flapless added as he considered the little wrens words. “Yes. That would seem to agree with the Book of Ancient Ways, but I never thought about it before. If this is true, then why do I fight the Wind?” Goliath asked out loud. Flapless and Goliath had talked way into the night, and when he finally fell asleep, Flapless knew he had finally made a friend. So it was that they both slept in late the next morning because they had stayed up so long talking. Goliath’s knowledge of the Ancient Book and Ancient Ways was amazing, and very helpful, because he had many questions about what it meant to be a Prophet? He did not know the Ancient Book like Goliath did. Had the wind sent the little bird his way, in order to answer his questions? Could the wind be that powerful? If the wind is All-Knowing, did it simply know the two of them would cross paths on this day, and there was no “making” the wren come, it was already going to happen and the wind knew it? Just how did this Prophet thing work? Flapless was not sure he wanted any part of it. Goliath told him the story of the Prophet Jeremiah, and how he saw things that were future, things God wanted him to warn the people about, because the people were living very bad, and very bad things were coming because they were living so bad. The people needed to change their ways and listen to God, but they did not want to change, and so they got mad at Jeremiah, and they threw him into a muddy sewer pit, and left him to die! Flapless did not like the thought of people hurting you because they are mad at God. Goliath said, had it not been for a friend of Jeremiah’s, who was willing to risk his life and go before the king to beg for him to be saved out of the pit, that he would have died there! But the king relented and Jeremiah was saved. Many years later he would eventually be murdered because of speaking God’s word, just like so many other people have been down through time. Goliath had shared many stories and not all of them were bad. It was great to be a Prophet when things were good. Some Prophets had great power, like Elijah, who was eventually taken to heaven in a flaming chariot with horses! He went to heaven without ever dieing! But so many of the Prophets, Daniel, Isaiah, Elisha, Samuel, and even Elijah, had to endure many hard things because they heard the voice in the wind. They heard what others were not hearing, or refused to speak it out, but they spoke, and they endured much hardship because of it. A bird for hard times, Flapless repeated to himself as he finally fell asleep late that night. Yes, he was a raven, and all his life he had been an outcast, and he knew what it was like to be laughed at, insulted, and hurt. Was this to be his whole life? He did not want it to be so. He did not want to be a Prophet who spoke of coming judgment and doom! But he wanted to fly, so what was he to do? Did the wind know the answer for him to fly? And what of what Goliath had said about flapping his wings? Flapless had fallen asleep last night with that last question in his mind, and so when he began to wake this day, he found it was still there! Even while he was still in the state betwixt and between, when you are neither asleep nor awake, but somewhere in between, drifting in and out. What had Goliath said about flapping? That he used his wings to fly counter to the wind? And if the wind was All-Knowing, then why would we flap so hard to go our own way? Should we not live a life of complete surrender and peace, because the wind loved us with a love greater than death itself? Flapless was sure he did not understand everything the little bird with the big thoughts was saying. He was sure Goliath understood what was going on here better than he did, but was not yet revealing all. Surrender? What had the wind asked before telling him to take the high road into the mountains? “Are you willing to trust me completely?” Yes, that is what the wind had asked. It was then, while in this state of drifting in and out, that Flapless realized that “complete trust” was just another way of saying, “surrender”. A life of surrender to the wind? If Goliath could have seen Flapless’s thoughts, he would have known that Flapless still did not “get it”. For whenever Flapless spoke of the wind, he was seeing it as a word having a small “w”, whereas Goliath, having a greater knowledge of spiritual things, when he spoke of the wind, he spoke of it with a capitol “W”! Because he knew the Wind, and the voice in the Wind, was connected to God! And if Flapless was hearing God, then this was indeed a most fortunate event that he would make friends with such a one, and he was determined to become a disciple, and follow him up into the mountains. As the two of them began to make ready for the new day, Goliath asked Flapless if he could accompany him on his great quest into the mountains? Of course Flapless was delighted to have a friend! And having such a one with great knowledge of the Holy Word was even better! It was exactly what he needed. And so it was that the one with greater knowledge of God’s Word, but could not hear God’s voice in the Wind, became the disciple of the one with lesser knowledge of God’s Word, but could hear the voice in the Wind, at least he could hear it sometimes, and he had a promise of hearing better in the near future. Goliath was very excited as the two of them left their campsite and began hiking in the direction of the tall gray mountains, the very scary and harsh looking mountains. What would happen to them there? What would they learn? And would this bird called Flapless, ever fly? It was about midday on their journey when they spotted a three-legged turtle up ahead slowly moving back in their direction. Flapless immediately recognized that it was Mr. Turtle, but however had he gotten ahead of them? It was with great anticipation they met and began to know his story. “I’m so sorry you had such a frightful night, but thank goodness you are still alright.” Flapless said. “Yes, thank goodness,” Mr. Turtle agreed. “Good to meet you, Mr. Turtle,” Goliath said. “Yes, I guess he has,” Flapless agreed. “What a silly question,” Mr. Turtle replied. “Of course I am weeks behind. Did you not hear a word I said about the pack of wolves and my frightful night? Nevertheless, I will consider what you have said when I camp at that tree I see up there, a day’s journey ahead. You see; I can always see my whole day before me. My day’s end is never out of sight. Farewell, and good luck on your quest, my fine feathered friends.” And with that, Mr. Turtle began moving on. “What a strange turtle,” Goliath said. Flapless and Goliath stared up into the mountain as if it were a forbidden land where birds go to die. The jagged and rocky cliffs towered over them like giants ready to strike! The fear of the unknown gripped them both, but the Wind had requested Flapless go there. “Are you sure this is what the Wind said?” asked Goliath. “Not even a peep,” Flapless confirmed. “There is a tree over there. Should we go camp at the tree and wait for the voice to speak to you again?” Goliath asked hopefully. The tree was not far off the path, so it only took a moment to arrive. Flapless stared up into it, and the mountain could still be seen through the leaves, standing huge and dark. He stood there silent and listening, and though he heard a breeze in the leaves, he heard no words, just the normal sound of the wind. So he decided to speak first. “Hello? Mr. Wind? Are you there? Can you hear me? We are at the mountain and were just hoping to talk a little more, you know? Like, do I still have to climb this mountain?” Then he stopped to listen. And Goliath listened with him, but not a sound was heard. No words. No instructions. “What do we do now?” the little wren asked. And so they turned and left the tree and all of its leaves to return to the path leading up. “Here we go!” Flapless said, trying to sound brave. “Yes! Here we go!” Goliath repeated. And so the two little birds began their brave upward journey into the land of high places, where rock and ground meet sky. They hiked and they hiked and talked about many things, until they grew more tired and began to talk less. “Have you heard the story of Zacchaeus in God’s great book?” Goliath asked. “Didn’t he climb a tree?” Flapless asked. “I think you better tell me the whole story,” Flapless recommended. “Wasn’t the great man he wanted to see, Jesus?” Flapless asked. “Yes, Jesus, the Son of God, but everyone was still trying to decide who this Jesus was? Was he simply a great teacher, a Prophet, a miracle worker of some sort, or was he really the Son of God? How well do you know this voice you heard?” Goliath asked. “Wow, that must have been quite a surprise for Zacchaeus. I doubt he, (pant, pant), was prepared for that,” Flapless said, while beginning to notice a shortness of breath. “Whew! This climb is getting steep. Look how far we have come already,” he pointed out. It was then that a gust of air hit the side of the mountain so hard that it bowled both birds over and started rolling them across the ground! They were helpless in the blast! Their wings flapping this way and that as they rolled and rolled until they were pinned to the side of the mountain itself! Thunder began crashing, and the rain was very close now, but not quiet yet. “And do what?” Goliath asked. Now the wind was not letting up at all but was roaring fiercer and fiercer as the lightning and thunder closed in. Flapless felt the first moisture beginning to strike, blown by the force of the wind, it even stung through his feathers as it hit. “The storm! It’s almost here!” Goliath shouted in fear. “Keep climbing!” Flapless shouted. He was the first to get a wing tip over the edge of the ledge to pull himself up. It took all his strength to do so, and his heart pounded so hard as he pulled his exhausted body up and over the ledge. He wanted to turn around and help Goliath, but as soon as he hit flat ground again, the wind started rolling him and blackness swallowed him up! Now the rain hit in a sudden torrent! Goliath had not yet reached the ledge when he saw Flapless disappear. He felt like he was drowning, the rain was falling so hard and heavy. He was not sure he could keep going. “Am I going to die here?” he fearfully considered. But inch-by-inch he kept struggling upward as long as he had breath to fight, and finally he felt the ledge! More lightning flashed all around him, and thunder cracked so loud he thought his ears would explode! Pulling as hard as he could, he rolled onto the ledge and was swept away just as Flapless had been. He hit something, and then he was swallowed by darkness and falling! But he did not fall far when he landed on something soft, and heard Flapless give a sudden groan. “On a good note,” said Flapless, “ our hole in the rock is not water tight. There is a crack over here. I can feel it. The water is leaking out. At least we will not drown, but this is going to be a very cold and miserable night. If this is what the mountains are like, I want no part of it. If we live through this, when the rain stops and it is daylight, I’m heading back to the flatlands. The mountains are as horrible as I was afraid they would be. I’m cold, wet, and miserable. I’m done with this. Let someone else climb the sycamore tree.” And with that, Flapless went silent, and Goliath did not know what to say. Hour after hour the only sound heard was the cold wet howling wind. It was as if it wanted to eat them and was furious that it could not get them. The two birds shivered side by side in the hole as water constantly blew in and ran down the sides, and then out the crack. “Hmmm,” Goliath said, but the sound rattled from the shivers in his body, and then they both laughed out loud as hard as they could! When the laughter finally stopped they felt warmer, and the sound of the storm was finally letting up, but it would not be daylight for several more hours, and there would be no coming out of this hole until then. “Sounds good to me,” Flapless agreed, and the two friends quickly fell off to sleep. Since they were sleeping, the rest of the night passed swiftly, and soon they could see light at the top of their hole, reaching down into their darkness. “I’m not sure I can climb out of here,” said Flapless. The plan sounded good and so Goliath fluttered his way up and out while Flapless waited, still trapped below. Finally he heard Goliath grunting, groaning, and tugging at something up above. He hoped the little fella did not hurt himself trying to drag so large a limb. First he saw his little tail feathers sticking over the hole and jerking all about. Then Goliath disappeared and the end of a stick began to move in. He must have grabbed the other end at that point, because he suddenly flew up and dropped the stick in. Sure enough, the little guy had done it! Flapless climbed the limb and burst into the sunlight excited to still be alive! Flapless looked out at the clear blue sky. It was still frigid, but warming quickly. He looked around for any more signs of storms, but could see none at this time. “Well, when you put it that way. Our lives below are pretty pathetic. I’m a bird called, Flapless, and I have only two friends, a wren called Goliath, and a turtle called…? Come to think of it, I don’t even know his name!” And then they both fell over laughing on the ground! “Me too,” said the little wren, as on their way they went. More hours of steady climbing passed by. They had not reached the clouds yet, but they were getting very high. “So do we know what we are looking for?” Goliath asked. “I guess we are looking for the top,” he answered, and they continued on. “Who said that?” Flapless shouted! “Just people I’ve heard,” Goliath answered, somewhat startled by his friend’s sudden wild –eyed look. “Wait!” Flapless said, “I think I simply heard the wind?” They both sat silent for a minute, hoping the voice would speak again, but so far, nothing. “What did the Wind say?” Goliath finally asked. “Wow! That is so cool!” Goliath exclaimed. It was not easy to scrape up enough wood to have a small fire that night, but with the help of Goliath flying about, they could have a small one if they rationed their supply. There was something about a campfire that was very comforting, and tonight, while the wood crackled and the embers glowed, perhaps they would commune with the Wind. And what did the Wind have to say to Flapless? He could hardly wait to find out. He had come all this way just so he could hear more from this special voice who was All-Knowing. Now it was dark as the little fire gave a warm light in the stone cold of the mountainside. It took the bite out of it, as they sat very near the glow. It was built in such a way as to be close to a big rock, which partially blocked the cold wind and also heated the rock. The rock thereby became another source of heat as it absorbed it from the fire. It had been a very hard journey into the mountain, with the storm the day before, and a cold wet night; both birds were weary to the bone. Food had been very lean also, but were they not on a spiritual quest? This was a time of seeking. It would be worth it all. Flapless had a great need for answers, and now he had a friend who was also looking for answers through him. This was new for him. He had only been laughed at before, but now someone saw something valuable in him? He did not want to let Goliath down, but what kind of answers was he expecting to get? Goliath already knew how to fly. Would the voice give him great spiritual wisdom to share with the little wren? As much as Goliath wanted to stay awake, Flapless had watched him slowly drift off. He was now sound asleep as Flapless sat silent and watching. He stared into the small flame with the hot embers, losing himself in the pulsating glow. Earlier in the night, when the fire was still young, Goliath had given him a scripture to hang onto. Now he had quoted it several times as he patiently waited. It was a beautiful scripture, and it seemed to sum up everything Flapless had been hoping for. There was also a knowing in him that he did not have before, something that developed during the two days of climbing. It did not surprise him when Goliath fell asleep, and it did not surprise him when the voice finally spoke, because he knew it was going to be here, and it was going to be tonight, so when the voice came, there was no surprise. He also finally understood; he recognized the wind, as the Wind! So he patiently waited. “You have done well, Flapless, you and your friend. You stayed true to the last sound of my voice, even though things became very difficult,” said the Wind. His eyes did not leave the fire as he entered this communion. “What if I had turned back? What if I had quit, like I almost did, and went back down the mountain? What would have happened then?” he asked. “Your deep hunger never would have been satisfied. You would have continued to search and search, and you would have tried to fill the hunger with many things, but until you would finally hear and follow my voice, the hunger would never be satisfied,” the Wind answered. Flapless’s heart leaped with surprise at the mention of Mr. Turtle! What could he possibly have to do with this? “I don’t understand,” Flapless stated. The fire crackled and a bright moon hung low in the distance while he waited for the answer. Flapless realized that if the storm saved Mr. Turtle’s life, then he would have gladly endured it, had he only known, but the Wind did know all these things. “What?” Flapless almost shouted; he was so taken by surprise! “What? Is this some kind of a cruel joke?” Flapless thought. It was then that Flapless realized the Wind had just read his thoughts and answered him as if it were no different than hearing him out loud. “Wow, way cool! Maybe the Wind is All-Knowing,” he thought. “Yes, it is rather cool, as you say,” the Wind agreed. Flapless could not believe his ears! For the first time real hope sprang in his heart and soul! To soar like the eagles? A raven that soars like an eagle? How would this be? Could the Wind really make this happen? “Yipeee! Lets do it now!” flapless shouted! When Flapless shouted, he startled Goliath from his sleep, causing him to fall backwards off his rocky perch! The little wren hit the hard ground with a solid thump and then came bouncing right back up in a great flurry of wings and feathers! “What’s wrong? What’s going on? What’s the matter? What did I miss?” he questioned. “Nothing is wrong, Goliath. I’ll tell you everything later. You can go back to sleep,” Flapless offered. “Okay,” Blink! And he was sound asleep again. “I know you do, little bird, but your wings are already as I want them. You will not fly as other birds fly. As I said, your flying will depend upon you being faithful to the high places. You will spread your wings and launch yourself like a mighty eagle, but you will never flap! You are my chosen messenger to show my people the power of a flapless life. Do you trust me completely?” the Wind asked. “Do you believe I am All-Knowing?” the Wind asked. Something came over Flapless at that moment. It was as if a river of great joy was springing up in his belly and flowing out his mouth! Tears flowed. Emotions flowed. A great release sprang forth from within! Flapless let go of all the pain he was harboring inside, and gave it to God. He forgave those who had called him names, and began trusting completely. And with that, Flapless suddenly fell into deep sleep! Just as the Wind had said, Flapless slept one hour and then woke feeling very refreshed. Then he woke Goliath and felt sorry for the little bird because he had slept so hard he was almost drunk! His words slurred, his eyes blurred, his legs walked with a wobble, and his head was all ruffled. “You should feel extra good today,” said Flapless. “Fred is Tripod? Wait a minute, you said you did not know his name, and why would Fred Tripod be up here?” Goliath’s mind was racing so fast he could not ask his questions quickly enough, and Flapless was enjoying watching the wren bounce about, because all that extra energy was overflowing into his little bird body language. Fred was slowly making his way down the path when he heard Flapless yell and quickly discerned they were in tomorrow’s territory, but rapidly approaching his today. So he stopped, blinked once…then twice…and then a third time, as he watched them approach. “Tripod! I mean, Fred! Fred?… I mean, Mr. Turtle! How did you get ahead of us again?” Goliath finally blurted out his question, still very flustered and bobbing about. “Well, if it passes before noon, then it is probably just morning sickness,” Fred advised. “I’m not pregnant!” Goliath yelled at the top of his lungs before beginning to see spots. In his excitement the thin air was taking a toll. “I give up,” the poor little wren finally said, as he huffed and puffed trying to catch his breath. Goliath’s eyes were big as acorns, but he did not say a thing. “We are here to help you, Fred,” said Flapless. “Oh yeah! We been laughing about this for days!” Goliath blurted out while slapping his knee. “Butter on the bread?” Flapless asked puzzled. Flapless noticed that Trinity was not saying anything, but was doing an awful lot of blinking. It was obvious that he was plenty worried that a psychotic pregnant wren named Goliath was about to do something to him called a wheel. Trinity was no longer blinking, but he had his eyes solidly closed, afraid to open them, not wanting to see whatever it was the crazy wren was going to do to him. The trio spent the next hour celebrating and sharing their stories, but most of all, Goliath and Trinity both, wanted to hear what the Wind had said to Flapless. So he explained that he was to meet an eagle at the top of this mountain, and the eagle was going to train him in the ways of the Wind. He told Goliath that the Wind called him a Joshua, and he would be his helper. “A Joshua? Wow! Joshua is a great Bible character!” Goliath proclaimed. Flapless went on to explain how mankind does so much flapping, that they are too busy to enter the high places and learn to soar. They do not take time for serious prayer, which is a special surrender that is very precious to God. This was to be his message to mankind, this message about prayer, surrender, and soaring. The greater the surrender, the purer the gold. Soon it was time for Flapless and Goliath to press on. “How about you, Trinity? Would you like to go with us?” Flapless asked. Goliath hopped on Trinity’s back and said, “Give me a ride, bro!” It was all great fun, as the friends parted to carry out their separate deeds. They were now a team for God… Flapless, Goliath, and a three-legged turtle called, Trinity. They watched Trinity disappear into the cloud line below, as he was moving much faster than before, and it was, after all, downhill. The sun shined brightly on the top of the clouds. Flapless and Goliath looked out across the powder white puffs, like a bright quilted blanket of cotton as far as the eyes could see. “Did you ever think you would see such a sight?” Goliath asked Flapless. “Yes, it takes your breath away,” said the little wren. There was not a lot of climbing left to go, so they were not expecting a long day. If they did not find the eagle at the top, then they would set another campsite and wait, but that did not prove to be the case, because just an hour later a mighty eagle came swooping down out of the sky and landed gracefully before them! “Ho! Are you the bird known as Flapless?” the eagle asked. Goliath looked like a speck before the great winged creature, and for once he was utterly speechless. It was true. For since they had climbed above the cloud line, the mountain was covered with white snow. It was not deep, just a hard crusty covering they were easily able to walk on top of. The eagle bowed low and spread one great wing out on the ground to allow them to climb on. “Don’t say anything about the turtle!” Goliath whispered to Flapless as they climbed on. “If only Trinity could see us now!” Flapless shouted. “Nobody important,” Goliath shouted as he shot Flapless a dirty look. But Flapless was in a world of his own. “Faster!” he shouted to the eagle. “Fly higher!” he cried. “This is a bird after my own heart,” the eagle thought. “He gets the grand tour.” And away they went, swooping, diving, and gliding over vast valleys and jutting cliffs! White-capped peaks zoomed by at tremendous speed, and they shot holes in fluffy clouds as if they were a winged bullet from a gun! It was awesome and Flapless loved every minute of it, before the mighty eagle finally headed towards his mountain citadel, high upon a cliff. It came into sight strong and bold, it was as a mountain fortress, safe from the dangers of the lowlands. How impressive it was, and here it would be that he would learn to live like an eagle. For the next seven days this would be his home, an eagle dojo. I can believe that, Flapless thought to himself. “Wowwwww….” Goliath said in utter amazement. “Thank you for your great kindness, Sky Shadow,” Flapless stated. As Sky Shadow had said, he had everything ready for his guest, and in no time at all the fire was started and burning strong. It was obvious the mighty bird had soared about collecting the best of woods for the fire, and his skill in choosing was proving true. The meats were run through with a metal bar. Flapless could see fat dripping as it roasted over the flames. Goliath, however, was not a meat eater and he had his eyes on the fat berries piled before them. What a feast they were about to have! A feast worthy of kings! Another full moon was just coming up over the mountain peaks as the trio settled in for their night. Its eerie glow cast upon the white-capped mountains was a sight to be seen. “It surely is,” Flapless agreed, and so did Goliath. The three of them just sat there for a while, at the top of the world, a fire flickering, a full moon glowing, white caps casting a majestic presence, and the smell of meat cooking over an open flame. All three knew it didn’t get any better than this, but what price had been paid to reach such a moment? It had not come easy. It had not come without being willing to leave the low life behind, and follow a voice into the high places. It had required ignoring what others said or thought, and staying true to a voice not everyone heard, but now all was confirmed, they had passed a test, they had not fainted, and here was the reward. After this would come more tests, more hardships, but also more rewards. This was the way of life on planet earth, a place of choosing, testing, failing and rewarding. Some people chose wisely, and some did not, but how could they even know if Prophets, Preachers, and Teachers did not proclaim God’s Word? The truth must be told, so those who desire to choose right, will know. Everyone deserves the chance to choose right. “Yes, sir,” Goliath answered with eyes as big as the moon. It startled him when the great eagle looked in his direction and spoke directly to him. He thought this was all about Flapless, and maybe his time would come later, but no, the eagle saw him, too. The eagle missed nothing, not even a bird as small as he. Everyone bowed their heads and the mighty eagle gave God thanks for the food he had so graciously provided, and that they did not go hungry this day, but were blessed above measure, and for this he humbly gave thanks. After the prayer, Sky Shadow carved off some meat and handed it to Flapless, while Goliath was already picking out some berries to enjoy, along with a couple small worms he had found. The two little birds took their new Bibles with great care and admiration. Flapless had never had a Bible of his own, and Goliath had lost his when trying to escape a cat one day. “Flapless, please turn to Romans 11:29 and read us what it says,” Sky Shadow requested. As he turned the pages of his Bible, so did Goliath. And as Flapless read, Goliath carefully followed along. “Yes. There you go,” the great eagle said. “Do you know what that means?” he asked. “That he will not take his gifts or calling back?” Goliath ventured an answer. Flapless was very quiet as he listened to Sky Shadow, but the eagle saw the concern in his eyes. “Go ahead and ask your question,” the eagle said. “Yes, sir,” both Flapless and Goliath answered in unison when Sky Shadow paused and looked at them. The moon was higher in the sky now, and most the food had been consumed as the friends continued their conversation. Both Sky Shadow and Flapless were drinking hot coffee that was rich and black, while Goliath had settled into a hot cup of green tea, a strange drink he never had before, but discovered he loved very much. “Now there are three very important things you must remember and practice if you are to live a life in the high country. In order to make it easy to remember, I call them the Three ‘P’s.” Sky Shadow explained. “The Three ‘P’s?” Goliath repeated. “Yes. The Three ‘P’s,” the eagle confirmed. “Now the Three ‘P’s stand for this; Praise, Prayer, and Promises. Write them down and memorize them. Praise…Prayer…and Promises,” he repeated, as the two little birds scribbled notes in their Bibles. “Let me explain why this is so important. The flesh does not trust the Wind. The flesh does not like surrender. Our carnal mind does not think like God and will resist Him. So how do we keep our flesh down and our spirit man up? We MUST give the spirit man what he needs to stay strong! For the flesh must be kept down and this is not an easy thing to do, unless we learn that God supernaturally helps us. But God can only supernaturally help us if we apply His supernatural principals of Praise, Prayer, and Promises. These things keep us humble. This is very important! You must remember to be weak and surrendered towards the one you love! These things keep us humble and obedient…so that…as the scriptures say…GOD will LIFT US UP! Who lifts us up?” Sky Shadow suddenly asks. “God will!” they both quickly answered. “That is right,” the eagle emphasized. “God will, not us, nor anybody else. This is the soaring life of the eagle. God lifting us up. ‘They that wait upon the Lord…’. It is said so very plainly, and yet we wrestle with our wings, because the Three ‘P’s require time and work. True love also requires time and work. We must not weary in well doing, but as warriors, we must exert the weapons of our warfare!” Sky Shadow stomped his foot and Goliath fell off his perch! “Oh, sorry little fella. I sometimes get excited when teaching God’s Word,” Sky Shadow explained. “That’s alright. I like it!” the little bird with the big name shouted, and they all chuckled for several minutes while they refilled their hot drinks. But as they returned to serious conversation, Sky Shadow said the Three ‘P’s would be tomorrow’s subject, and now was the time for easy conversation and the asking of questions, before they would retire for the night. And so it was that upon a lofty moonlit cliff, a mighty eagle was explaining things to a raven and wren, about how to live as an eagle. Another hour passed quickly by and then everyone turned in to their bird bunks for a good night’s sleep, but Flapless was so anxious about tomorrow that he did not sleep right away. His mind was filled with thoughts of, “Will I fly tomorrow? Will I launch from a great cliff out into thin air? And what happens if I fall? How can these broken wings that do not flap possibly ride the Wind?” Thoughts like these filled his head as he finally fell hard asleep. And to this day, no one knows the dreams he dreamed that night, for the writer has not shared them, and neither has Flapless. Flapless swallowed hard at that last statement, but was relieved he would not leap today, for in his heart of hearts he knew he was not ready. He was glad that Sky Shadow seemed to know what he was doing. Breakfast was light and before they knew it class was being called to order with Sky Shadow ready to teach, and Goliath and he ready to listen and learn. “So what are the Three ‘P’s?” the eagle asked. “Praise, Prayer, and Promises!” they answered. Flapless became very quiet as he thought about this. However, now Goliath had a question, and slowly raised his wing. “Yes, Goliath. Excellent question. Upon reaching a certain mastery of this lifestyle, a lifestyle Jesus himself exhibited, you will be a wren living like an eagle, and Flapless will be a raven living like an eagle, and you will be able to share the good news of the flap-less, and soar-more lifestyle with others. Who wants to flap when they can soar? That is the question that haunts mankind, and yet they fall into the same trap over and over again. God is sending the two of you to make a difference in the way people start their day, and live their lives. More people flapping-less, and soaring-more, will cause a great change in the earth. The enemy will fight it tooth and nail, for he fears this revelation taking hold. But God has always used the minority to upset the majority and turn the world upside down! For the world does not understand God’s wisdom, and when it is right side up, they think it is upside down, and it really freaks them out! L-O-L!” the eagle said while laughing. “L-O-L?” Flapless looked at Goliath who was also cracking up! “Yeah, you know. Don’t you?” Goliath asked, and then realized, “No, he probably don’t!” And then they both laughed more and more before explaining to Flapless about texting lingo. Once this was accomplished, Sky Shadow told Flapless and Goliath that the next few days of their training would simply be spent developing a strong Praise, Prayer, and Promise lifestyle. This was the critical element to reaching a spiritual point of complete surrender and trust upon the Wind. He explained that this was the hard part, and once this was completed, then it was just a matter of sensing the voice and leaping out there. Well, a little more than that, he corrected. I will be showing you the fine points of soaring, but the real hard work will already be done, he confirmed. Sky Shadow also explained that the way we approach our devotional time can make a big difference. If we come with the joy of praising the God that has blessed us so much, and connected us to such an incredible future, then we will not see it as a drudgery, but we will simply start praising our God and then it will flow into all the other things we need to do, including the hard work of praying the fervent effectual prayer of a righteous man that avails much. It’s not all fun, he admitted, but it is very important work that must be done, especially for someone walking in a Prophet’s office. And so it was that the next few days became full of time spent in worship, prayer, meditation, memorization of scripture, study and reading of scripture. Each day began with at least a short time of praise and prayer. It did not take long for Flapless to begin to see a real difference in the way he thought and felt. His world was changing, and it was real, and it was powerful. And the question was so obvious, why live a life of flapping, when you can soar? Finally the day had come, day six, and if everything went well today, as Sky Shadow expected, then on the seventh they would rest. Once again the day started as each day had been starting, with the Three ‘P’s, and Flapless was extra exuberant in his devotions, because today would be his great leap into thin air, and he needed all the anointing he could get! He was still very nervous about it, but the intense fear had been replaced with such a love for the Wind, that he could hardly wait to leap into the arms of the one who was All-Knowing, and trust his fate to the Ancient of Days. “Are you ready, Priest of the Most High Wind?” Sky Shadow asked. “Yes, Teacher,” Flapless agreed. “I will be careful, and I will remember,” he confirmed. Sky Shadow stretched one of his great wings to the ground as a signal for Flapless and Goliath to climb aboard, and so they did. The eagle had already explained that there was a sacred cliff they would go to for his launching, and now they were on the way. The wind soared through Flapless’s feathers as he hung onto the broad back of the mighty eagle. The sacred ledge was not far away; it could actually be seen from the eagle’s citadel, and so they arrived in no time at all. The two small birds climbed off and surveyed the vast expanse before them. Goliath knew this was Flapless’s moment, and so he backed away acknowledging the reason they were there. Both birds could feel wind currents rising up out of the valley bellow, but which current was the right one? Since Flapless had no ability to flap whatsoever, he had to be very careful to catch the right current from God that he was meant to soar upon. As a Prophet this was very important. Whereas others could flap their wings and flutter around until they finally got it right, he had to get it right from the start! “Thank you, Teacher. I understand. Then Sky Shadow spread his great wings and launched out into the thin air. Goliath was in the back taking in every moment. Sky Shadow makes that look so easy,” he thought to himself, but he did not speak anything out loud, for this was such a serious moment for his friend who had never flown in his entire life, a bird with broken wings. Goliath considered what it would be like to leap out into that nothingness knowing that your wings cannot flap. He could not imagine how scary that could be, even if there was a great eagle promising to catch you. So he continued watching as Flapless finally stepped up to the very edge of the sacred cliff. His shinny black feathers were ruffling in the gusts of wind. Goliath noticed him close his eyes and slowly turn his head, like he was listening for something. The drama became so intense it was all Goliath could do to keep his mouth shut, because that had never come easy for him, but suddenly before his very eyes he saw Flapless leap out into the great expanse with his black wings spread, and he was gone! Was he falling or soaring? Goliath was not sure as he raced to the edge and watched, holding his breath the whole time, but not even realizing it! His wings were still outstretched! He was not falling like a rock, but he was in a downward swoop, moving so fast that it looked deadly! Where is Sky Shadow? Shouldn’t he be swooping in? Goliath was about to go into a complete panic when all of a sudden, Flapless, the bird with broken wings, started rocketing upward! He had caught a special Wind! His instincts had not failed! Sky Shadow recognized it from the very beginning and now was joining him high in the sky to fly together! It was such a beautiful sight! Goliath was so happy for his friend that he began to cry. “I’m sure glad nobody is here to see me crying,” he thought to himself. But tears filled his eyes for sure, as a black raven who had never flown, named Flapless, was soaring with the mighty eagles. Who would have ever thought it could be possible? They stayed out there for a long time before finally returning. Flapless was so full of joy that he could hardly contain himself, and Sky Shadow was very proud of his student. Much congratulations were in order before Goliath faced his own leap of faith. The little bird closed his eyes and turned his head as he had seen Flapless do. Then he felt two winds hit him, and he leaped! But he chose the wrong one and as he started to fall he instantly began flapping. “Drats!” he scolded himself. Goliath remounted the ledge and tried again. He flapped again. “Three strikes and you’re out,” he thought, even though he knew Sky Shadow would have him keep trying. He remounted and stood poised to try again. Goliath suddenly leaped again and he was gone, soaring like a mighty eagle! A little wren soaring like a mighty eagle! And he was happy! Sky Shadow and Flapless could hear him shouting with glee even from where they stood. “Lets go join him,” Sky Shadow said, and away they went together, soaring in the high places, soaring with the eagles. The whole day was spent in this way, and when they finally landed back at the citadel, their hearts overflowed with grace. It was now the seventh day and Flapless could hardly believe how much his life had changed in the high places. He would never go back to his old way of living, but had chosen to live in the ways of the eagle. He did not make this choice because it was easier and the old way was very hard. Certainly not, for eagle life required many things and there was nothing easier about it. Flapless was not looking for “easy”, he was looking for purpose and passion that had true meaning. That is what he had found in the white-capped lofty mountains. He never knew he could have a living and vibrant relationship with the All-Knowing Wind, and that Wind could carry him into an incredible life with promises of eternity. Now it was almost time to take this message of “Flap less & Soar more” to the people in the flatlands. Tomorrow morning Goliath and he would leap out upon the Wind and descend to the mission field, but today was a day of rest and focus. He had left the fortress citadel of Sky Shadow immediately after breakfast. He wanted to find a place to be alone, and so he stepped up to the edge, sifted through the currents until he heard the right one and launched. He was not sure where the Wind was taking him until he saw the huge waterfalls ahead. This was perfect! Even better than he had expected. With his glossy black wings spread as wide as he could get them, he soared into the misty spray of the falls. The water thundered all around against the rocky cliff walls ascending upward and higher than the falls. The sound of the water roared as it searched for escape, and it filled the cavern with such a powerful presence! This would be it; his place to spend a few hours, think about his mission, praise and pray, and listen to the voice in the Wind. He was anxious to go back to the place he had left. He left in such defeat, but now he would return in victory! Everything had come full circle. All the ridicule that had driven him away in search of better answers had now worked to his good. Instead of accepting defeat, he had gone on a great quest and the Wind had come to his rescue. Now he would tell everyone he knew, about the great kindness and wisdom of the All-Knowing Wind. His life had become an incredible testimony that it was true, but he also knew there would be those who refuse to believe. Some of those birds are just bad to the bone. They do not want their little empire upset, because they have attained a certain position in the world of flapping. They will do anything to maintain their power, even to the hurt of others, even to the denial of a better way. However, Flapless also knew there would be those eager to learn, and he was going to start a school! What exciting things lie ahead! He found a grassy spot on a ledge and simply listened to the thundering water for some time, before beginning to praise and pray. Many voices tried to come to him. These were evil winds carrying lies and fear, trying to deceive and destroy. There was an evil principality over the kingdom of flapping, and they did not want any Prophet speaking light into their dark kingdom. They loved tormenting people. It was known by various names, such as “The Rat Race”, “The Treadmill”, “The Daily Grind”, the mind numbing act of going through the motions of life and chasing every distraction in a feeble attempt at some real joy! But it always fell short of what it had promised, and the victim was always a little more weary and disheartened each time, until they simply gave up and accepted that everything was a big lie, and then eventually you die and it is over. Flapless stood upon the promises of God’s Word and defeated the lies that would try to deceive him. He rebuked the evil winds in God’s holy name, and soon the voice of the All-Knowing One came, and they had fellowship. When Flapless finally returned to Sky Shadow and Goliath that evening, he practically glowed. And so it was as they started up the campfire for one more night, each of the birds rejoiced in the victory that was theirs, and the blessed hope that was to come. There was no lack of joy or excitement at this final meal together, for tomorrow held the promise of great things. The sun rose the next day right on schedule, and soon the little birds were ready to descend back into the lowlands of flapping. “So what is the first thing you intend to do?” Sky Shadow asked. “First we will find our friend, Trinity, and see where he has made it to,” Flapless answered. “It is, but he is not so slow anymore, because Goliath fixed him up with a wheel,” Flapless explained, while Goliath stood there smiling from ear to ear at the thought of it. “Well I’ll be,” the mighty eagle said. “I would like to meet him some day. “Did you say eat him?” Goliath asked. “No. To ‘meet’ him,” the eagle corrected. “Trinity is a little shy around eagles,” Flapless explained, “but we will see what we can do,” and then he stuck out his wing to shake feather-tips with Sky Shadow. They all three promised to see each other again, then Flapless bowed his head as Goliath stood by. They did not know where Trinity would be, but the Wind knew. So when Flapless suddenly leaped, Goliath leaped right behind and they were on their way. Sky Shadow stood there watching the pair descend into the low places, on their way to fulfill God’s mission. He could see the Wind ruffling their feathers as they flew. Flapless had his wings spread wide and strong while Goliath followed his lead, trusting in his ability to hear the voice and catch the right current from God. Within seconds they were out of sight. Both birds were thrilled with the sense of a great mission, and a great adventure ahead. Flapless could feel the current turning. He could feel the edge of it, and cross winds trying to cut in, but he dare not cross that edge for he had no power to flap his way back to the current from God if he lost it. He would have to land, and then spend precious time tuning back in, waiting for another wave to come along that he could ride. So he had to be very careful and when he would come too close, it was necessary that he make adjustments back towards the center of God’s will. Soaring on the edge was a fool’s game. It was too easy to accidentally slip over and find yourself in a bad wind. Now the two birds could plainly see the ground below. A road was coming into sight. The Wind shifted with that road, and they found themselves following it. “Aye aye, Captain!” the little wren shouted just before breaking up laughing. “Get it? Aye, aye? You said keep a sharp eye? Get it? I crack myself up,” Goliath declared. About another five minutes of soaring went by when both of them spotted a slow moving dot on the road ahead. “I think our target is coming into sight, sir!” said Goliath. Another ten seconds and there was no doubt it was the box turtle, Trinity, moving slowly but steadily ahead. After another ten seconds they could even see the wheel connected to the back corner of his shell. “Yup, that’s our turtle,” Flapless confirmed. Two small dark shadows began circling over the turtle plodding along his way. At first he tried to ignore the distraction, but finally curiosity got the best of him and he decided to stop, blink one time…then twice…then three…before looking up. “Ahoy there, Trinity!” Goliath shouted, as he was always the more vocal one, and most always beat Flapless when it came to the art of idle conversations. And so it was that the two birds landed gracefully back on the ground to meet up with their friend and share all the good news. Trinity quickly gave a report on how wonderful the wheel was working and how much better he felt in every way. Then they spotted a shade tree near by and decided to spend the rest of the day catching up on all the details, for there was much to talk about. First they told him all about the great eagle called, Sky Shadow, and how he wanted to meet him some day. “No,” the pair chuckled. “He wants to ‘meet’ you!” and again they chuckled over and over about this silly assumption. “We have been trained in the way of eagles!” Goliath finally shouted with great joy. “That is right,” Flapless confirmed, as the conversation began to become more serious in nature. Trinity looked at Goliath who had first said it, then he looked at Flapless who had confirmed it, but neither were now speaking, so he did what he always did when he was not sure what to do, first he blinked one time…then he blinked a second time…and then a third…before asking, “Well, what do you mean? Can a raven, or a wren live like an eagle?” Now he waited for one of them to answer the question. “It is so, Trinity,” he began. “We have been fed a big lie, a great illusion, a parallel perception that is much lesser than the reality God has for us. We have an enemy, and he is known as the great deceiver. He has tricked us into believing that the more we flap and the harder we try, then the more life will reward us, but this is a great deception, for from the very beginning God intended flapping to simply be an aid to soaring, and it is even possible to attain such a mastery as to greatly reduce all flapping! This is what the eagles know! Sky Shadow explained it this way; he said it compares to a game of chess, or the precise strike to cut a diamond.” Flapless paused to see if he understood? Flapless smiled, a spark flashed in his dark eyes and he very carefully said, “The war is on,” Darkness was settling in even as they spoke. It was decided to camp under the tree and continue their conversation into the night. And so they did. “Yaa!” Goliath rejoiced. “We are a trio now! The Three Amigos! The Three Stooges! The Three Musketeers! The Three…? The Three ‘Flap-no-mores’! What are we going to call ourselves anyway?” Goliath asked, a little breathless and confused. “Lord please help us,” Flapless prayed under his breath. Goliath and Trinity were watching the black raven pacing back and forth just a little ways off from them where he had some privacy. He had explained to them what he needed to do, but this was untested, and therefore he was not sure of his ability to do it. He asked for them to be in prayer, but so far they were so caught up in the drama of it all that very little praying had been done. Flapless was already praying. He was in a world of his own creating and did not even know what Goliath and Trinity were doing. He was progressing steadily through deeper and deeper chambers of Spirit, into the Holy of Holies. His worship had turned to prayer, and now his prayer was turning to promises, “They that wait upon the Lord,” he declared, “shall mount up with the wings of the eagle,” he could feel something building, but he was no longer working at it, because his spirit was so caught up in the power of God’s presence that it was a river he had no desire to shut off, free-flowing, no longer an effort to stir up, it was here and growing! “They shall run and not grow weary,” he continued, “they shall walk and not faint!” A supernatural lifestyle he reminded himself. And before the Wind even hit, his wings shot out to his sides just as the Wind arrived and he was instantly lifted, shooting like a rocket straight up into the air! “Wow! Did you see that?” Goliath shouted. But Trinity could not answer, for he was totally speechless and reduced to blinking innumerous times, as he watched the little raven shooting higher into the sky, and clear out of sight! Goliath was just the opposite. He was running around like a chicken with his head cut off and his mouth talking non-stop! He was a jabberjay! He was beside himself and only a slow moving turtle to share the moment with. “I need a rabbit!” he shouted. Goliath flapped his wings and instantly lifted off to join his mentor in the sky. It was true that flapping was a lot less time consuming for leaping into your day, but soaring had other benefits that more than made up for the investment required to maintain a place in the high places. An hour of soaring was all that was required for the town of Imasomebody to begin appearing on the horizon. Flapless was coming home, and he was coming riding upon a sacred Wind. He was coming to his own, and he already knew most of his own would not be happy with his apparent “success”. To make it worse, not only had he gone on a great quest in search of answers, not only had all the scoffers claimed he must be cat food by now, not only was he returning alive and with answers, but he was not flapping! How could a bird with broken wings be flying? How could a bird fly in the lowlands without flapping? What strange thing could this be? Now the town had lookouts posted at the four corners of the city, and as they spotted a black dot flying straight at them, they sent out a general alert, because no one was supposed to be in that sector at this time. Was a visitor coming to town? The little wren could not even be seen yet. A fifth tower, known as the Gate Tower, caught the alert and quickly grabbed the binoculars to check the approaching unidentified object. The Gate Tower was the first to see the smaller bird with the black bird. They were also the first to see that neither bird was flapping! The alarm was immediately upgraded from a general alert to an “All-Hands-On-Deck” alarm of the highest order! Until now it was only eagles that ever swooped over them in such a manner, so what could this possibly be? Such a strange sight indeed, eagles disguised as some other birds? Nothing in their training had prepared them for such a thing as this! Flapless and Goliath was almost at the city walls when squadrons of ravens lifted off and entered the sky to intercept them. Flapless knew the military leader as a very hard bird known as, General Deathlock! He only knew him by reputation, for he never would have lowered himself to even be aware of the Flapless who left town, a broken and defeated bird too ashamed to stay anymore, or at least that is what he would have been told. But now here he came, full-speed ahead, backed by trained forces to intercept any threat and deal with it! Flapless began to circle, and Goliath followed his lead. “I’ll do the talking,” he said. They were surrounded by what seemed like a thousand shinny black flapping wings in no time at all, but Flapless just kept circling, waiting for a spokesman to appear, and it turned out to be General Deathlock himself! “Identify yourself, stranger, before I order you blown out of the sky!” the General commanded. “Flapless?” he heard his name being repeated over and over again through the ranks; his name was spreading like wildfire, for if there is one advantage to being the joke of the town, it is that a lot of people know who you are. “It cannot be,” some were saying. “He’s supposed to be dead! Is he still flapless? How can he not be flapping his wings? Flapless could not flap his wings, but how is this bird flying?” The tension was building rapidly, even before the General could bark his next order. “You will come with us!” he demanded. “I will not,” Flapless calmly answered, “for this is my home, and I have broken no laws. I am free-born! I am not enslaved to your flapping ways,” he challenged. Flapless could see the temperature of the General rapidly rising, for it seemed the Wind was giving him wisdom in all of his answers, and he was even shocked by his own boldness under such obvious pressure and danger. Even now Goliath was checking for emergency exit signs just in case this whole thing blew up, which it was about to do! “Seize them!” General Deathlock suddenly shouted, and a thousand black wings began to dart in, each having shackles in their talons, ready to bind! So far Flapless had simply been declaring whatever he heard in his heart from the Wind, so he had no real plan for what was about to happen next. However, the All-Knowing Wind did, and it was time to upset some well-established lies of the enemy. Suddenly, the air current Flapless had been riding shot upward at a speed impossible for any flapping creature! The strongest and fastest of the General’s trained soldiers gave pursuit, and for a few seconds managed to stay close, but as strength quickly left them from the great effort, they fell embarrassingly behind. But they had to keep going. They had to keep trying, because the only alternative was to return in failure to General Deathlock, and no bird wanted to do that! So their struggle continued as they fought to climb higher! How was the bird doing this? Even the wren had fallen behind and occasionally flapping, but this raven with the broken wings, how was this possible? How was a raven soaring where only eagles go? Nobody was laughing now, not even Flapless, because this was serious business. He was not here for vindication, revenge, or to seek his own glory, but word needed to get out that a new way of living had come to town, and there was no way the media was going to put a lid on this! Even if the soldiers could all be silenced, which they could not, but even if so, too many eyes on the ground were watching this incredible drama playing out. Too many ears had heard the name Flapless being repeated in disbelief. The genie was out of the bottle, the truth displayed for all to see! But that did not mean everyone would want to stop flapping and change their ways. No sir, Flapless knew the Truth Storm had just begun. He would fly away for now, and wait for them to come to him in the desert. The General was already looking foolish enough. He would be very careful to pick his battles now. There would be those among the common people, the nobodies, who would want to know more, and they would come, and the light would grow. Flapless had kept an eye on Goliath, fearing they would capture him in hopes of forcing a surrender to save his friend. 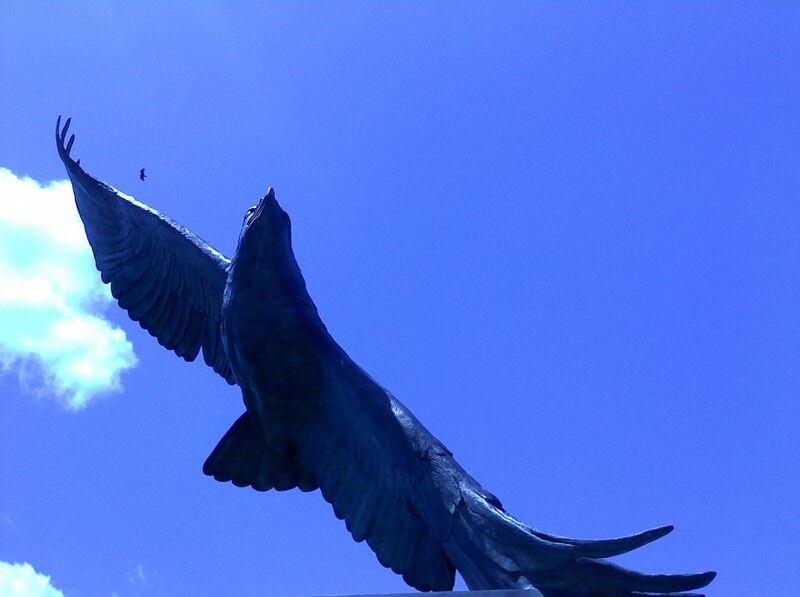 He was prepared to swoop down for a rescue if need be, but Goliath had just barely gotten high enough, quickly enough, to make a narrow escape. Now a glossy black raven and a little wren were quietly soaring over the city, like eagles, making sure that one and all beheld the sight, as they disappeared into the wilderness to the north of, Imasomebody. “I sure am,” the little wren answered. “Good night. See you in two,” and Goliath closed his eyes. Flapless climbed up to a higher position on a rock. He surveyed the environment around them. It was basic wilderness, with heavy vegetation in some areas, desert places in others, high grounds and low grounds. This spot was just inside some vegetation, with a view of some open desert before them. The desert lay towards the city. Some would come seeking, and they would make an effort to connect with those who came. The school would be in the wilderness until such a day that the movement grew so huge they would not be able to contain it. Flapless had no trouble passing the time while his mind pondered how he would like to teach this “Flap-Less & Soar-More” lifestyle. He saw a building, very plain and simple, but efficient. There was a board in the room to write on, just like in a school, for this was a school, a school of higher learning for higher ways. What would he write on that board for the seekers to read? Praise – Prayer – Promises! Praise + Prayer + Promises = Power/Peace. Why fight an All-Knowing Wind? His thoughts departed from the board but continued thinking. He starred into the darkness of the night, searching for any approaching enemies, but the real enemy could not be seen with the human eye, or even a bird’s eye. The world system is our enemy. The people we are here to help are mentally hooked on that system. Many of them are not ready to leave what is familiar, for that which is uncertain. They have much invested into this system, and will not give up their life of ease and pleasure for a life of ultimate good, embracing their Creator. They are hopelessly dependent on the system, birds in cages, unable to think free, too scared of the personal responsibility that goes with freedom. They will cling to their false perception of reality. This system has Gate Keepers. These Gate Keepers can manifest and move through anyone still connected to the world system. I will always remember who the real enemy is. They are spiritual wickedness set in high places, principalities, and rulers of darkness. But their strength and power is still set in a world of rules that God has established! In Christ we have been lifted to higher places, if only we can believe it. All things are possible for those who believe. There will always be those who live out their lives oblivious to reality, ignoring God’s truth, straining at a gnat and swallowing a camel. They will not believe a perfectly painted picture could ever result from the explosion of a paint factory, and yet they believe all of creation is the result of a complete accident that sparked an explosion out of total nothingness? They strain to swallow a gnat, but easily swallow a camel. These are the ones I am called to go to. These are the ones we are called to love, and risk our life for. I will do that by remembering who the enemy really is, and by remembering who God really is. There is no greater calling than to lay down this life for the one to come. Even so, come quickly, Lord Jesus. Suddenly the Wind swept through lifting Flapless into the dark sky where a raven is very hard to spy. He swept around the land, he checked the desert sand, but no sign of an enemy was found. Deathlock would be scheming. He would choose his next move well, but a raven soaring in the night would be watching, like a watchman in a tower. Let the Ram’s horn blow, let all the world know, Jesus will come for his own. From the high places they are called, for his people hear his voice, and they soar.